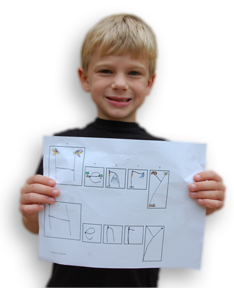 Henry excelled at reading and math, yet struggled with his writing. His parents and teachers tried and tried to help. Then his kindergarten class started using StartDOT Handwriting. Henry's teacher is thrilled with the results. So is Henry! 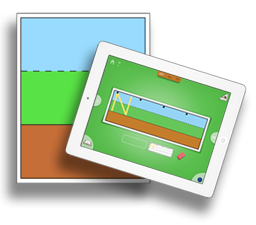 "Sky-Grass-Dirt" simplifies spatial concepts of top, middle and bottom. 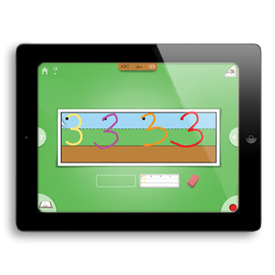 Children easily see where to position letters & numbers. 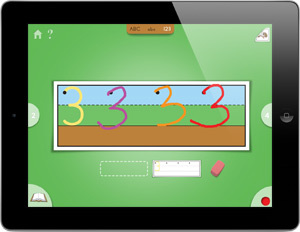 The StartDOT Handwriting app uses digital sky, grass, dirt paper which is identical to the real paper we provide for the classroom or practice at home. Writing made simple! Yes, handwriting is still important! When handwriting become automatic, students can focus on concepts, content, grammar, and composition. We all know that elementary school kids do almost all assignments by hand, but did you know that 33% of students struggle with basic handwriting skills? StartDOT can help! 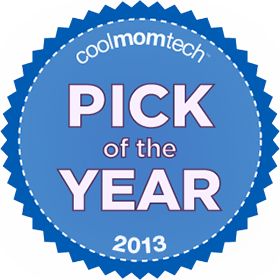 Unforgettable letters & numbers: pictures & stories boost memory. Learning made easy: wide error range & rainbow letters. 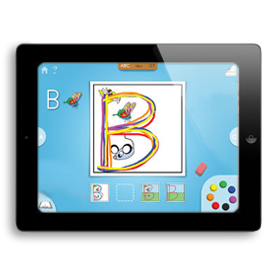 Letter groups & learning order: learn easiest letters first. Keeping track: follow progress for an unlimited number of users. Practice makes perfect: sky-grass-dirt writing paper. 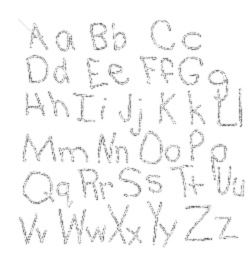 Uncover the “how to” mystery of handwriting with our fun and easy teaching method. StartDOT benefits beginners or children needing a little extra help to become successful writers! 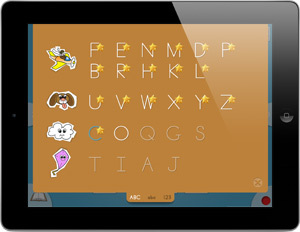 “StartDot Handwriting for the iPad is a pretty smart way for kids to learn and practice printing letters and numbers. It’s a cute guided tour to the alphabet, with airplanes zooming from the sky to the grass, and puppies running all over. But it’s also a great way for kids to grasp the process of writing, and to do so neatly too. Stopped by offices of Senators Levin & Stabenow and Congressman Walberg to talk about the thriving app economy in Michigan. SEE IT, HEAR IT, DO IT. The Learning Page is the first stop on the path to great handwriting. Identifiable pictures help outline each letter’	s form, and every letter tells its own story. Children see the animated example drawn for them, hear each story, and write the letter for themselves. Talk about multi-sensory. So many letters to choose from, but we make it easy with two options. 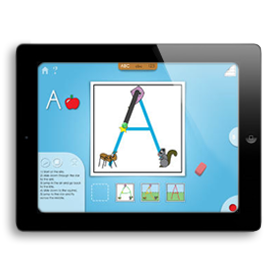 We recommend following the structured Kinesthetic Order (default), where the easiest letters are learned first. 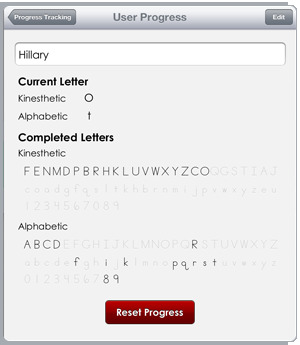 But if you want the freedom to jump around to any letter or number, just change settings to Alphabetic Order. Now that’s easy! Time to take those new letters and try drawing them on some digital, lined paper. 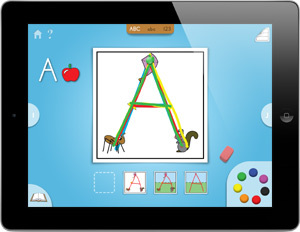 On the Practice Page, children reinforce what they’ve learned, and now forming their letters is becoming automatic. Now where is that paper and pencil? 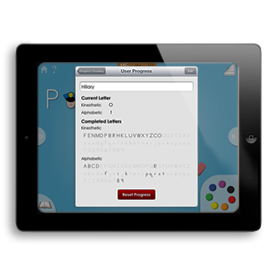 Check the status and progress of each child at a glance. Everyone learns at a different pace, and we help you keep tabs on that.